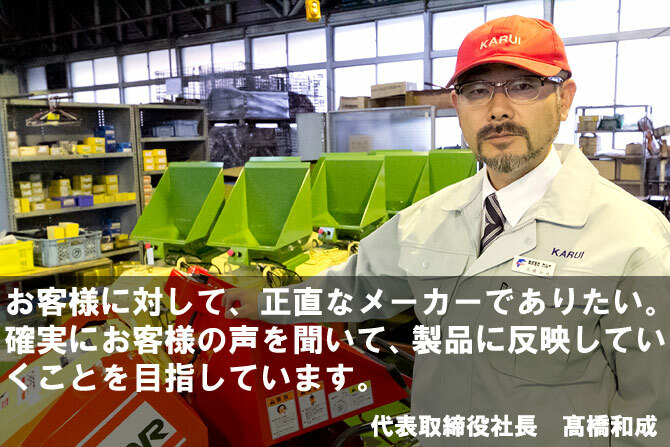 He was appointed to the Managing Director as the fourth generation of the Corporation Karui in 2000. After graduating from Chiba University, he worked for four years in a metropolitan area company. Then returns to Yamagata, he joined KARUI. After working in the manufacturing site and sales work, and he became the representative director. ―To our customers, and I do not lie, I want to be the honest manufacturer. In the manufacturing process, it may end up at the expense of the fact that when priority is given to the fact that A B. Then, customers who wanted to give priority to B to think “Why I’m not a B”, might be misunderstanding resulting in birth. This is why the anti-anti-, I have priority A. We want to be the manufacturer of the business in terms of explained properly and. Because we will continue to vegetarian in the future, by any means thank you.